Though the film is still in production, last week Comic-Con got the first official glimpse at Bryan Singer’s X-Men Apocalypse. And while that footage isn’t online yet, the first official photos now are, including Oscar Isaac as the tyrannical title villain Apocalypse. That’s the full cover of the new Entertainment Weekly and, inside, there are a few others images too, including a look at Alexandra Shipp as Storm, an ‘80s Mystique, played by Oscar winner Jennifer Lawrence and more. Check it out. But wait, there’s more. Here are the new mutants: Jean Grey (Sophie Turner), Nightcrawler (Kodi Smit-McPhee), Cyclops (Tye Sheridan), Jubliee (Lana Condor) and Storm (Alexandra Shipp). 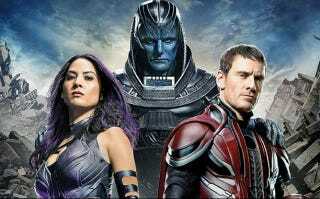 X-Men Apocalypse, now in production, opens May 27, 2016.